I am a novice at Sudoku and I have promised myself I wont be lured into it. Some promises are hard to keep. One always finds a way out. I have promised myself I wont be lured into solving Sudoku. So I made my own. Anyway, the way to make the puzzle inherently more dificult (Using larger grids to make “super”sudokus does not make it inherently difficult) is to minimise the constrained cells, preferably to 0. Once I figure out how to do that, no more Sudoku for me. Hehe…reminds me of my Rubik’s Cube days. 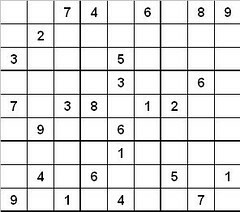 I have so far stayed away from this Sudoku thing.. Question (re. text above comments box) : to do a trackback, don’t you need to provide a trackback link or am I missing something? Never mind! D’Oh! The word trackback is a link…my RSS Reader didn’t pick that up, but regular browser did…strange. Came across this blog purely by coincidence. You have an excellent blog. Some very well thought out posts, written in an engaging style. Keep up the good work. Sudoku is all the rage here in the UK these days. But making your own one, that sure is impressive. Aha! Rubik’s cube. The first time my mom bought me a Rubiks cube, I surprised her by solving it with relative ease. I had one with stickon colors on its squares and I just plucked them up and stuck them right – Dint know you had to solve it the hard way. Maybe because of my initial embarassment, I never really got hooked on it. Sudoku is addictive, BTW. Dont try it if you havent yet. Venkat, do u use bloglines? >> Sudoku is addictive, BTW. Dont try it if you havent yet. I have a bloglines account but hardly use it. I downloaded a client software called “RSS Reader” , which works pretty well for the most part. BTW, why dont you add your comments to the feed too? BTW, why dont you add your comments to the feed too? Just realised I dont have it in the sidebar..will add it in. thks.